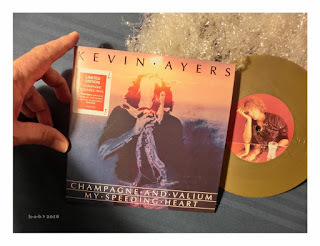 Qualche rara copia prodotta ad aprile in occasione del Record Store Day dev'esser finita nel sacco di Babbo, se qualche bimbo buono se l'è vista consegnare nei giorni scorsi tra uhh e ahh d'incontenibile ammirazione: è un Kevin Ayers da collezione, con Champagne And Valium e My Speeding Heart stampati in vinile biondissimo, trendy quest'anno come non mai. I brani non son nuovi e nemmeno di massimo pregio, ma la confezione e il pensiero quelli sì inebrianti. Letteralmente! Kevin Ayers, the hugely influential and much-loved British singer-songwriter, founder member of Soft Machine and free spirit, died on 18th February, 2013. Thirty years previously, Kevin released his controversial album Diamond Jack And The Queen Of Pain from which the two stand-out songs, the chillingly beautiful Champagne And Valium and the driving electronica of My Speeding Heart were released as a single by Charly Records. Exclusively for Record Store Day 2017, both tracks have been cut directly from the recently discovered original Audiofilm Studios analogue master tape by Matt Colton at Alchemy Studios and pressed on “champagne” coloured vinyl and released as a strictly limited edition 7-inch single. The single features a full-colour picture label of Kevin while the picture sleeve adapts the original Charly sleeve with beautiful imagery from the singer’s home in Deià.